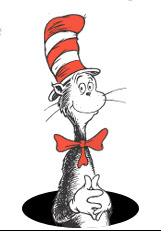 I grew up on Theodore Gesell's Dr. Seuss books: The 500 Hats of Bartholomew Cubbins, McGillicuddy's Pool, And to Think That I Saw it on Mulberry Street, Horton Hears a Who, Bartholomew and the Oobleck, Horton Hatches an Egg ... and on and on and on. Then, when Becca was tiny, I rediscovered the good doctor, and we read The Cat in the Hat and One Fish Two Fish and Green Eggs and Ham aloud endlessly. Great prose, wonderful poetry, magnificent drawings.